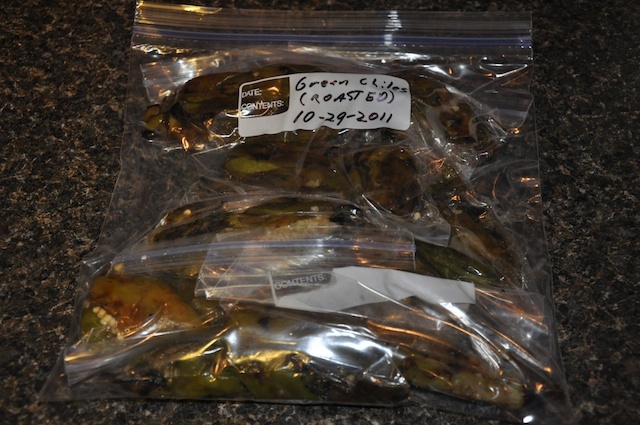 Back in early September, we bought a bag of roasted green chiles at the Clark Fork Market. 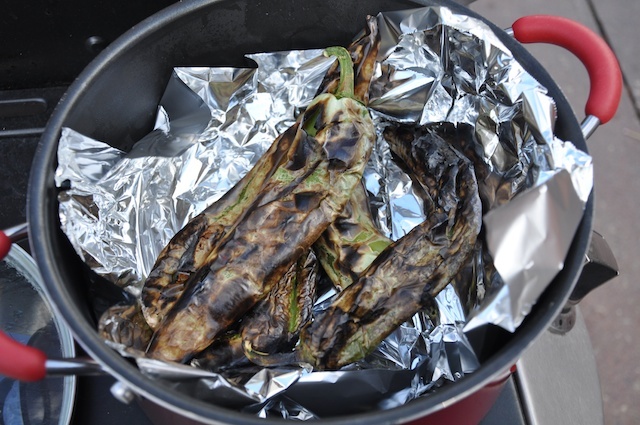 This was Renee’s idea, as she used to get roasted chiles all the time when she lived in New Mexico. I remember the peppers smelled great in my backpack on the bike ride home. We peeled and froze them. Then over the next month or so we thawed them out in small batches and used them on pizza. Pepperoni, mushroom, and green chile pizza is delicious! 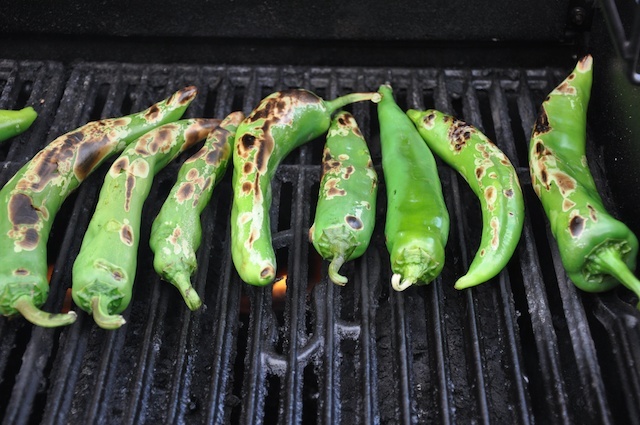 Green chiles are also great on hamburgers. Once I saw how quickly we flew through that one-pound bag, we realized we needed to stock up on more. But every time we went to the market, the pepper-roasting people weren’t there. Last weekend was the last market of the year, and again we didn’t see the people with the roasted peppers. So we decided this called for a do-it-yourself project. 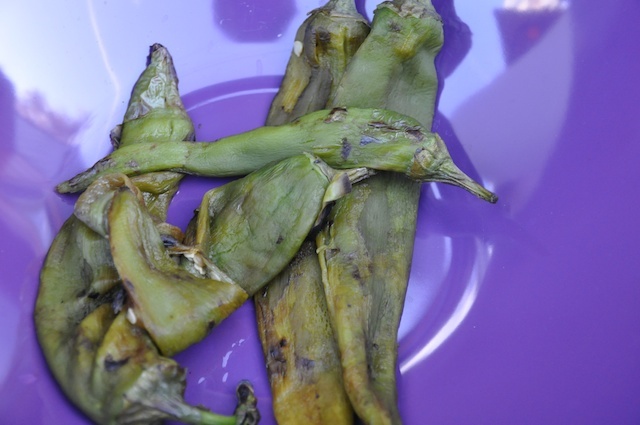 We bought a huge pile of fresh green chiles and then came home, determined to learn how to roast them ourselves. 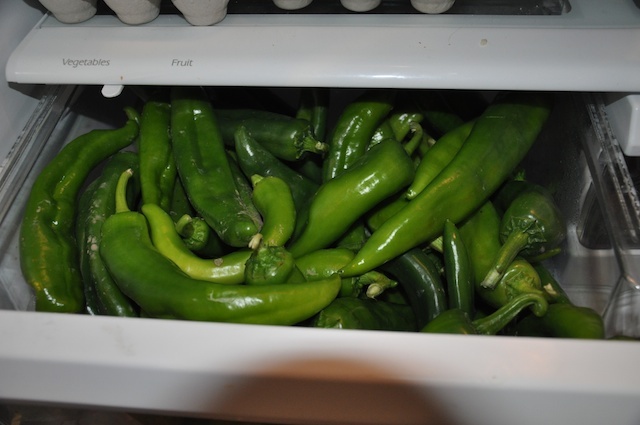 Drawer Stuffed full of peppers! We didn’t have time to work on this at all the weekend we bought them, so the peppers sat in the crisper drawer in the fridge all week. They pretty much took up the entire drawer! So today I knew I had to get this task done. Renee had to work on a different house project (I’ll probably write a post about that too), so it was all on me this time. 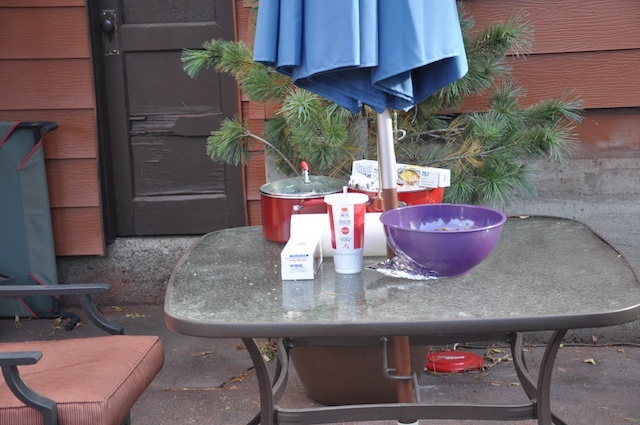 After reading up, I fired up our big gas grill, gathered up a few supplies and got started. The first step was to wash the chiles. 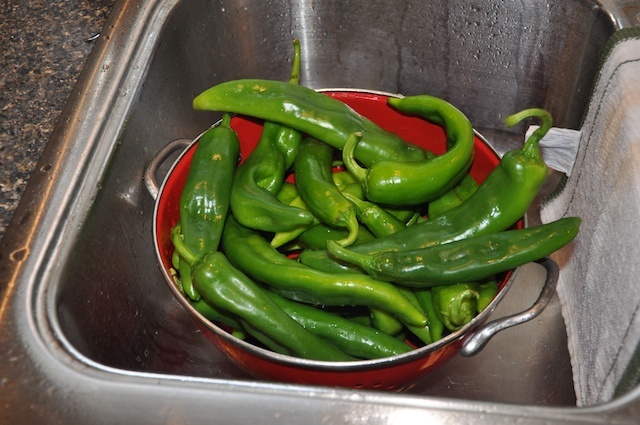 I did them in batches, so I loaded up the sink with peppers, washed them well, then filled up my colander. Next I put the first batch on the hot grill. The peppers were big enough that there was no danger of them falling through the grate, so I just placed them right on the grate. I started with just a few the first time so that I could get the hang of it. It was also good to have plenty of room to turn and move them around. First few peppers on the grill! 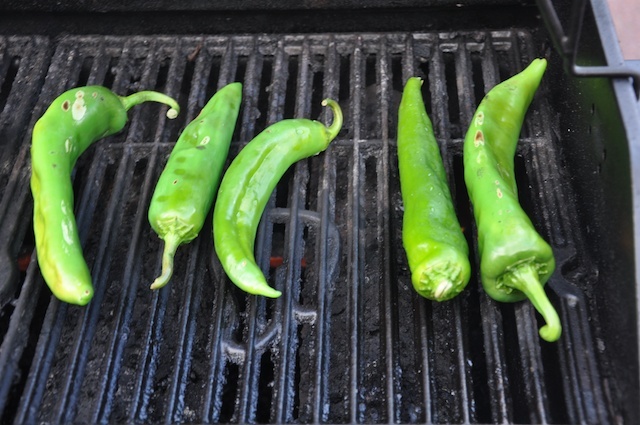 I used tongs to turn the chiles several times to roast them evenly. 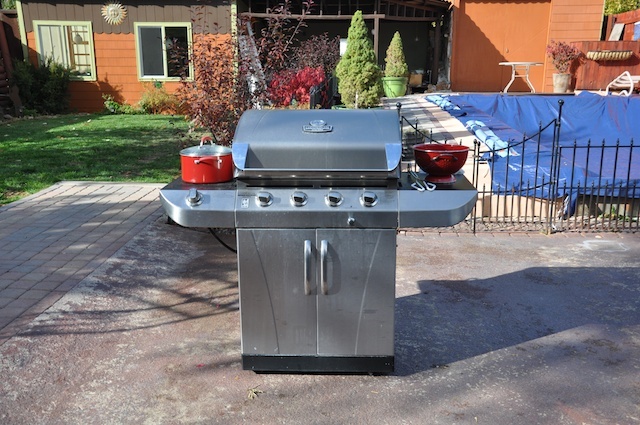 The goal is to get them nicely charred on all sides. This picture shows just the very early stages of this — these peppers still have quite a ways to go. As I went through the batches of peppers, I figured out that it worked best to initially place all the peppers with their stems pointing in the same direction. Then, as I turned them sideways, I also flipped them end-to-end so both ends cooked evenly. Once a batch of peppers was nicely charred, I took them off and put them in a large pot with a lid. The purpose of this is to let them steam a bit, which is supposed to further soften the peppers and make them easier to peel. Since I roasted the peppers in batches, but only wanted to use one pot, I decided to wrap each batch in foil. They are supposed to steam for at least 15 minutes, although my later batches were probably in much longer than that. According to the articles I found, you could also use paper bags to steam the peppers. The peppers smelled especially great every time I opened the pot to add another batch. Once the first batch had steamed for a good 15 minutes, I started working on peeling off the charred skins. At this point I was doing three things at once: peeling peppers, watching the peppers still on the grill, and running back into the house to gather and wash the next batch to get it ready for the grill. Peeling was probably the most time-consuming part of this process. It seemed that the larger peppers were the easiest to peel. I had intended to take all the peppers into the house to peel when I was done with the grill, but it was such a beautiful fall day out today that I decided to just do the peeling outside. Once I finished roasting the last batch, all that was left was peeling…and peeling…and peeling. When we bought that one-pound bag at the market, I just froze the whole bag. This was a little inconvenient when I wanted to actually use some of the peppers since I had to hack chunks of frozen pepper off each time. So this time I decided to make individual packets to freeze, each one about the size I would need for a recipe. 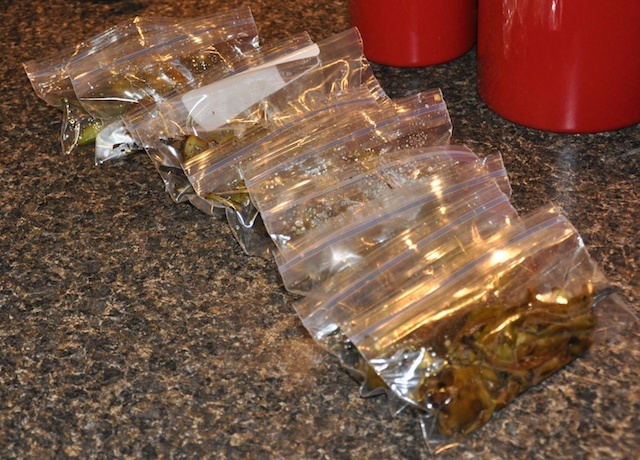 So I separated the chiles into 10 little snack bags, then put the whole set into one large freezer bag. 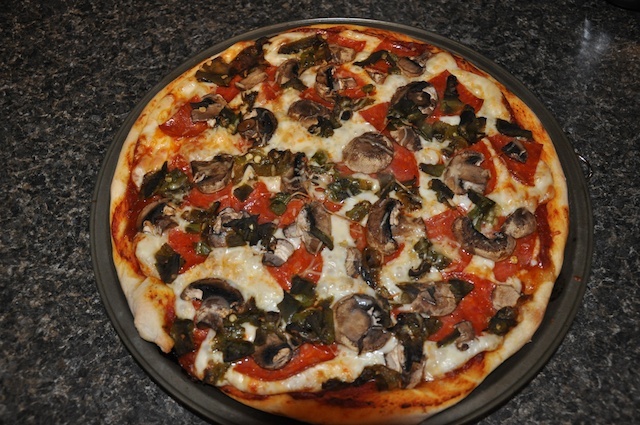 After smelling all these wonderful chiles all day, we had test them out with a pepperoni, mushroom, and chile pizza! Dinner time! The roasting was a success! Overall I was really happy with the way this “DIY” project turned out. It was definitely a fun way to spend a fall afternoon, and the results tasted great!